An intense level of customer focus is a trait you'll find at any company known for world-class service. The only "problem" is that we don't often get to peek at these companies specific practices: details as to what these companies are doing differently is often lacking. Today I thought we'd shed at least a little light on what these "Usual Suspects" of notable service seem to get exactly right. Before we get into the nitty gritty, let's begin with a reminder as to why the investment in great service is worth the effort. 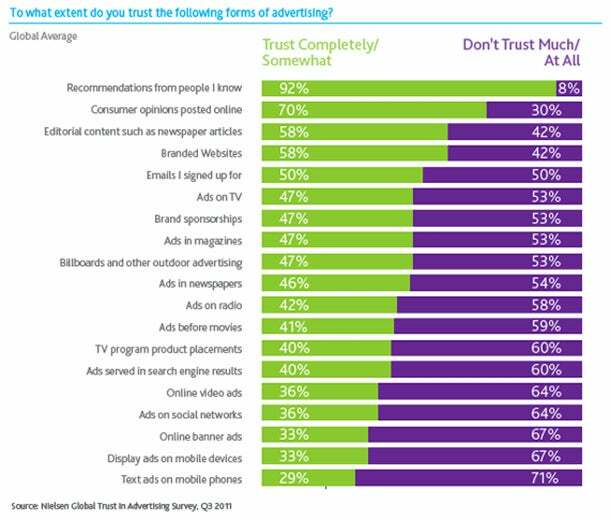 In Nielsen's Global Trust in Advertising report, "Recommendations from people I know" has once again trounced every other medium for level of trust. It pays to have happy customers, and since we know that customers are ready, willing, and able to reward companies with great service, it's smart to study the best in the business to see if we can find takeaways that are applicable to what we are building. Amazon is one of those companies that regularly tops the charts for their outstanding service. Anyone who has had to return an item to Amazon knows how helpful and flexible their support team is. This is likely due to the fact that few founders are as passionate about their customer's experience as Jeff Bezos. Absurdly sharp and insightful, Bezos is an oft quoted idol in all areas of business, but some of my favorites thoughts from him are his viewpoints on how to treat customers. Bezos periodically leaves one seat open at a conference table and informs all attendees that they should consider that seat occupied by their customer, 'the most important person in the room.'" In his efforts to build such a customer-centric company, you might not be surprised to find that Bezos expects all employees to be able to interact with customers. Bezos asks thousands of Amazon managers, including himself, to attend two days of call-center training each year. The payoff: humility and empathy for the customer." The practice of Whole Company Support has only grown more popular since then, and it's not hard to see why--understanding how your customers view, use, and talk about your product is vital information that often gets left behind on the front lines. Why should support reps be the only people getting their hands dirty with the people who purchase products and services? Even the top of the food chain can benefit from the insights of regularly refreshing themselves with the customer's perspective. And if the top brass at Amazon can spare some time to talk with customers, why can't you? One of the best stories in customer service has to be the tale of Joshie the Giraffe. It's one of those examples that proves why the "hype" around Ritz Carlton's customer service is well deserved (read more about Joshie here). One lesson that you might not expect to find, however, is how proactive Ritz-Carlton is in planning for mistakes and accidents. When you really think about it, this actually makes a whole lot of sense--it's much harder for employees to keep their cool when situations start going bad if they're ill-prepared for surprises. When my wife and I were staying at the Ritz-Carlton Buckhead, we were waiting a long time for our entr?es. Just when my wife was about to ask about our order, the waiter appeared and gave us a tomato and mozzarella appetizer 'courtesy of the chef.'" Notice how this tactic works: With a relatively small gift, the staff can reset the internal clock with a customer by establishing a new "last point of contact." While it's not the perfect solution, it's certainly better than a waiter returning to a table multiple times to say "I'm sorry." IF a customer has been waiting for more than 20 minutes, THEN reset their internal clock with a complimentary item from the appetizer menu or with a free drink. Ritz-Carlton employees are trained to anticipate the unexpressed wishes of their guests. During one stay the receptionist called me and said, 'We see that you are scheduled to leave very early tomorrow. Can we leave a pot of fresh, hot coffee outside your door?'" IF a customer is scheduled to check out before 7am, THEN offer to leave a pot of fresh coffee outside their door. This sort of planning helps employees remember key touch-points with customers, which will in turn aid in their ability to provide exceptional service more consistently, a surefire plan to increase your company's overall customer satisfaction rate. The customer focus at Nordstrom has led to the retail giant having a reputation for absurdly good service. In fact, the company is perhaps known more for its service than for the merchandise it sells. Nordstrom has managed to make service its strongest selling point, and it certainly seems to have been the smart choice. Consider Nordstrom's competitor JCPenney. While Nordstrom bolsters their ability to provide great service year after year, JCPenney recently made the misstep of thinking that they could do away with coupons and sale prices. The insight to invest in what they do best has definitely been a key part of their success. But what exactly do their employees do differently? You'll gain an abstract sort of insight if you've ever viewed their notorious employee handbook, but fortunately, we'll be able to do a bit better. "Salespeople can offer to ring up your purchase without you ever having to stand in line." "Salespeople are taught to walk your bagged purchase around the counter to you vs. just handing it across the counter." "A Nordstrom salesperson rarely points. If you have a question about where something is located, they walk you there." "One-to-one service. In most departments, if you indicate the desire to shop, there is a salesperson designated to helping you find sizes, etc." "Separate checkout bays by department (unlike department stores like Sears or JCPenney that have central checkout bays that can feel like a cattle call)." I recommend you read her full list, but as you can see, the devil is definitely in the details--many of these practices are not outrageous by any means, but you are not likely to find them in many other stores. The most important thing to highlight here is each employee's nearly unfettered control in helping customers. It's well known that Nordstrom salespeople are incentivized to help customers leave as happy as possible through a very rewarding commission structure, and this practice manifests itself in the many unbelievable stories you've likely read about the lengths they will go to help shoppers (do you remember this one?). What's funny is that the employee handbook mentioned above is still relevant today--the #1 quality that Nordstrom looks for in employees (and looks to instill company wide) is the use of good judgment when taking care of customers. Just as important, the company gives their employees training, motivation, and the ability to take action on the values that they hope to achieve--no wonder the only rule at Nordstrom to this day is "Use good judgment in all situations." As paradoxical as it may seem, for a long time now some very smart entrepreneurs (such as Derek Sivers) have coached their customer champions to spend more time on the phone with customers, or at the least, not be imposed upon by the "time spent per ticket." Using ticket time as the yardstick for which great customer service is measured is fine...if you want a bunch of employees racing the clock to "deal" with customers as fast as possible, undoubtedly dropping the ball along the way. Few people understood this better than Zappos CEO Tony Hsieh, who (quite literally) wrote the book on memorable service in Delivering Happiness. Zappos uses call center technology to track average call time per agent. But the goal isn't to reduce this average... "It's more important that we make an emotional connection with the customer, rather than just quickly getting them off the phone." Instead, Zappos created a point scale called the Happiness Experience Form, which encourages reps to make a personal emotional contact, create a "wow" experience, and address unstated customer needs. This effort to improve the less easily measured, but far more personal aspects, of service contributed to a 5% improvement in the company's overall Net Promoter Score. 70-75% of purchases came from returning customers. They order about 2.5x more than single customers." The subsequently high level of customer retention that Zappos was able to achieve was the main reason why service became their biggest asset, and their main "marketing" strategy in reaching new loyal customers. So take a page from Zappos' book, and understand that in the quest to do things as fast as possible, many companies miss the mark, forgetting that customer service is all about what the customer wants and speed isn't always what they care about most. What builds a stronger tie to Arby's may not be whether a customer receives a sandwich in less than three minutes. Speed won't compensate for a cold, tasteless sandwich or for rude and incompetent service." Make sure your speedy service isn't leaving a bad taste in customers' mouths, either. To end our expose on the greats of customer service, I thought we might look at a piece of advice that doesn't get talked about all that much, likely because it isn't flashy or a "hack" of any kind. A lot of people have fancy things to say about customer service, but it's just a day-in, day-out, ongoing, never-ending, persevering, compassionate kind of activity." Very true, and a lesson that we regularly need to remind ourselves of as we peruse a myriad of articles on customer service tips (yes, even on this very blog!). You should take extraordinary measures not just to acquire users, but also to make them happy. Your first users should feel that signing up with you was one of the best choices they ever made. And you in turn should be racking your brains to think of new ways to delight them." Just like L.L. Bean, make sure your company isn't taking any shortcuts in delivering service, because as Beverly Sills is so oft quoted as saying, "There are no shortcuts to any place worth going." A version of this article first appeard on HelpScout.net.